Winning proposal for CHART ART FAIR 2018. Made in collaboration with Malte Harrig and Katrine Hoff. For the pavilion we created an open source CNC milled plywood modular system clad with clamped polycarbonate. 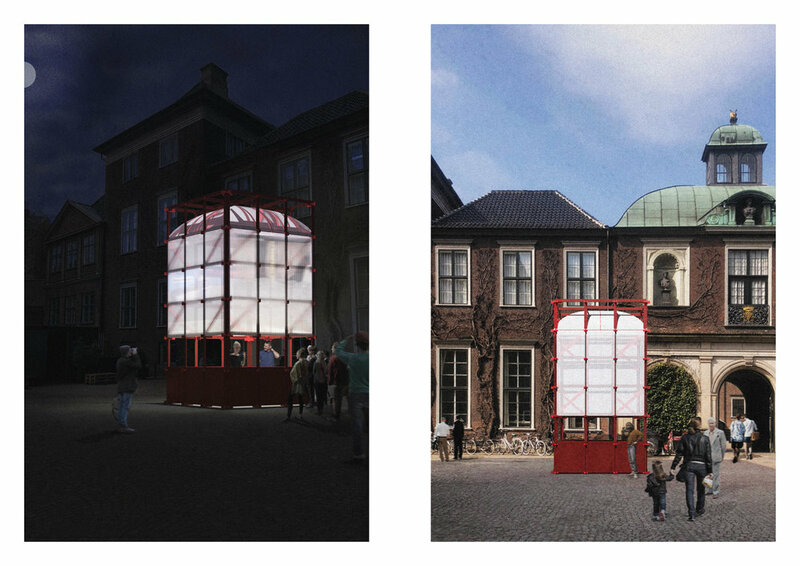 Inspired by art transport and packaging of art, the pavilion is at packable and can easily be dissem- bled. Making it possible to move it to a new destination and assemble again in the same or in a new constellation. A lot of artworks spend most of their “lifetime” being packed away in storage in between exhibitions or in private storages. Artist Katrine Hoff is creating the video in- stallation titled “How I Package and Ship my Artwork”. The installation consists of a montage of different YouTube tutorials on how to pack artwork and will be project- ed on the inside walls of the pavilion. The transparent walls will make it possible to view the work from outside, however this version will look distorted and blurry. As if it was a painting wrapped in bubble wrap. The modular system of the pavilion consists of modules that measures 1 x 1 meter. They are designed to fit on a standard plywood sheet of 2440mm x 1220mm. The clamped polycarbonate on each module is a standard 1000 mm x 1000 mm sheet. As an open source pavilion, other people can choose to clad the pavilion with other materials for example textile, plywood etc. We wish that people want to extend the modular system further and create new pavilions in other forms and dimensions.